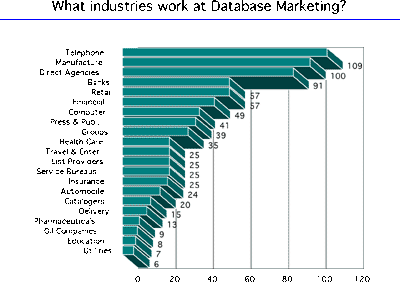 Database marketing has become a major program in most large companies in the US and Canada. It is really a new industry which requires new skills. Just who are the people who are running these programs? What is their background, where do they work, and what do they do? 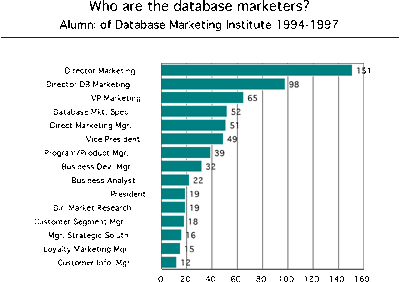 To get at the answers to these questions, we did some analysis of the alumni of the Database Marketing Institute. Since April of 1994, Paul Wang and I have given sixteen two-day seminars to 795 database marketers. 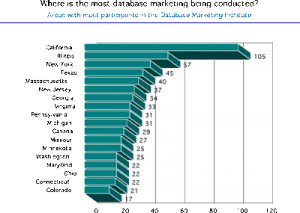 The data presented in this article is based on statistics from this group. There are scores of different industries sending participants to the seminars. Of these, three stand out: telephone companies, financial institutions, and manufacturers. Some are just getting their feet wet in this new industry, so their representation is small – see utilities, pharmaceuticals and oil companies. These groups will grow. 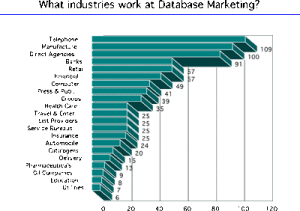 From the chart below, you will see that most database marketing is being done in California, Illinois, New York and Texas. Connecticut and Massachusetts are doing the most database marketing in relation to their population. 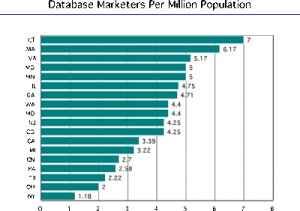 California is doing very little, and New York is at the bottom of the list. The New York total will be the most surprising to most readers. New York is, after all, traditionally the center of advertising. 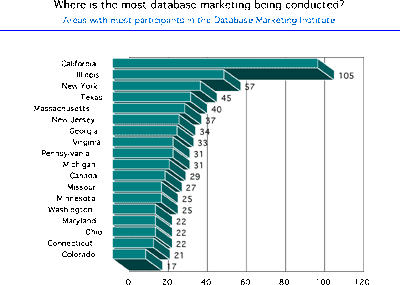 This is the home of mass marketing, yet this state is far behind most other states in database marketing. What could be the reason? There are a couple of obvious reasons. 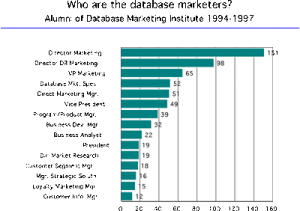 Connecticut and New Jersey are important database marketing states. Many New York firms have moved to the suburbs. That explains part of this phenomenon. But there is a more important reason, I think, why New York is so far behind. That reason is Madison Avenue culture. Mass marketing is centered in New York, and mass marketing is really the opposite of database marketing. Old cultures die hard. Marketers in New England, Virginia and the mid-west are closer to their customers than are the high priests of Madison Avenue. 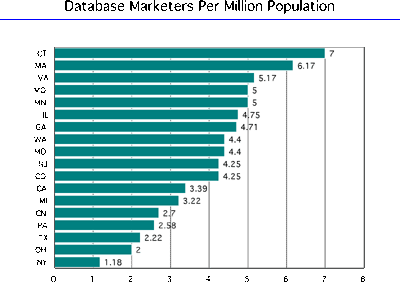 Which Companies Are Doing The Most Database Marketing? Here is another interesting picture. Telephone companies are deeply into database marketing. It is not surprising to see the main competitors studying this discipline. They use their databases every day to deal with churn and intense competition. Other major investors on the list, however, are surprising. IBM is no longer mired in their Big Blue culture. IBM is getting into database marketing in a big way, and is a major contender. So is Dun & Bradstreet. Business to business is one of the most successful areas for database marketing. Dun & Bradstreet – once thought of as a stogy old list provider, has been completely rejuvenated: they are putting themselves in a position to provide expert advice to their clients on how to make money with their business to business databases. Are these statistics representative of the industry? I would say both yes, and no. These graduates are not typical. They are the cream of the crop. The seminars are expensive and somewhat exclusive. Generally speaking, only marketers from the largest corporations come to these sessions. The following is a summary of the titles of the participants. There are very few presidents in the list. Why? Because the Institute attracts marketers from corporations large enough that the President would not attend such a seminar. Even more significant: there are almost no techies here. 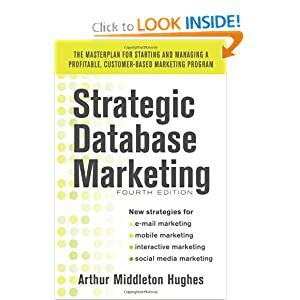 Some people think that database marketing is about databases. It isn’t. It is about marketing. That is why the seminar attracts people at the Vice President of Marketing level: people who are interested in the strategy of building customer relationships. Paul Wang and I have learned a great deal from working with these sharp marketers. For one thing, we have learned the importance of referrals. 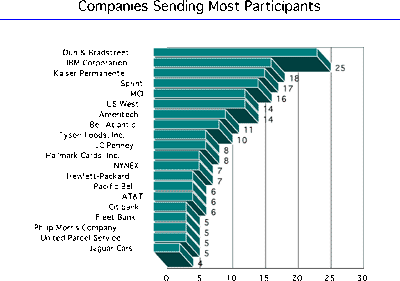 We do a lot of direct mail to attract participants. During the last three years, however, an increasing number of our students come from referrals. Last year 26% of our students came from companies that had already sent someone else. This year, the number is approaching 40%. 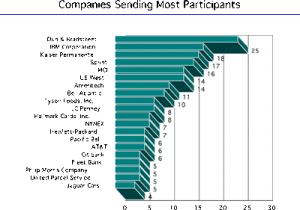 In all there are 144 companies who have sent more than one marketer to our seminars. Referrals, central to database marketing, really work. Many in the industry will remember our famous “Mary Letters” a year ago. Our direct mail pieces are always personalized: “This is a personal invitation to you, Jerry, to attend…” Through a glitch, the programmer who did the personalization of our direct mail letter a year ago did not personalize the body of the text. Although the letters were individually addressed to Ed, Bob, Janet, and Bill, the texts of all 20,000 letters all said, “this is a personal invitation to you, Mary, to…”. Four hundred and twelve people phoned, faxed, e-mailed and wrote to us. Some said “I would never attend a seminar on database marketing that is so poorly advertised…” Others were more humorous: “My secret is out! How did you find out about me and Mary?” Paul and I thought that the disastrous Mary letter would ruin our Institute. We immediately sent a letter of apology, first class, to all twenty thousand recipients (after first taking out the 169 whose name actually was Mary). No brochure. Just a straight apology for having sent out such a stupid letter. The letter was well received and we have survived. A few people, however, for some reason, did not see the original Mary letter. They just got the apology, and thought that it was some sort of sleazy marketing ploy. You can’t win. We think that the participants who attend these seminars are among the sharpest people in the industry. They are on the growing edge. These are the folks that are designing the marketing strategies that will dominate our customer relationships during the next decade.